Vintage Marshall-style mojo in a box. Plenty ot output. Marshall-style tone. Nice build. The Marshall-in-a-box style of overdrive/distortion pedal is becoming a staple of many makers, and different companies opt to emulate different vintages of Marshall. 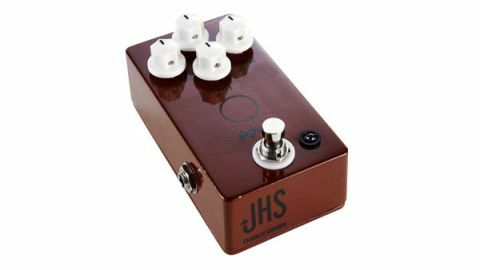 JHS says that the Charlie Brown is voiced to replicate the tone of a mid-60s JTM45. "It can give your amp that overdrive/distortion voice with a distinctly British flavour"
There's plenty of output here to offer a useful boost to your amp from about midway on the volume knob and turning up the drive knob yields degrees of dirt from grittiness, through increasing levels of raunch to the full overdrive you'd get running an early Marshall at full whack, all usefully controlled with guitar volume. The tone knob covers a wide range that will get you in the right ballpark, but it's the presence knob that lets you fine tune the top end to complement your amp. This is a fine overdrive pedal anyway, but if you have a hankering after a Marshall tone, it can give your amp that overdrive/distortion voice with a distinctly British flavour.